What a thrilling conclusion to the Gabrielle series! 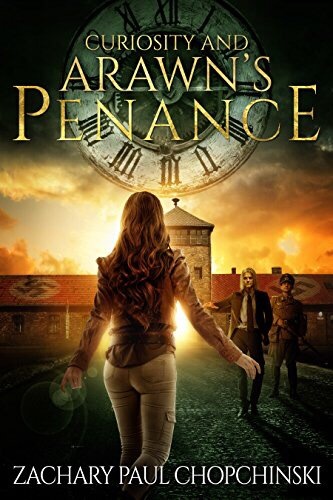 This time around, Gabrielle and a trio of fighters are on a mission to assassinate Adolf Hitler. Their reasons would seem obvious, but the reality is that Hitler and his Thule Society have been tapped by Arawn to gather objects of power as well as harvest souls. The first two thirds of the tale focus on this aspect of Gabrielle’s journey, culminating in an epic fight against Arawn himself. I loved Gabrielle’s verbal sparring matches with the malevolent god. After this battle, though, there is still so much story to tell! Old friends make incredibly welcome returns to Gabrielle’s story and I loved how Zach Chopchinski wove characters from all four books into the final chapters. It was like a family reunion! All together, the entire Gabrielle series is a story about family, love, and doing what is right no matter the cost… lessons we could all learn a little more about. So slip on the magic bracelet and take a journey! I highly recommend it. Thank you so much Zach for the opportunity to be an ARC reader! Please be sure to read this wonderful series! Now that all four books are out, I’ll be revisiting the entire series soon as I read it aloud to my family. My 10 year old daughter will love it, and there’s so much action I know my teenage son will be enraptured as well. You can get your hands on the series HERE via Amazon (currently available in Kindle Unlimited).